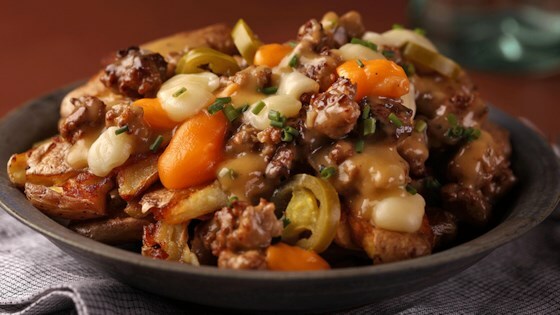 "Crispy brown fingerling potatoes are topped with homemade sausage gravy, cheese curds, and pickled peppers to make this deliciously decadent brunch dish." Sausage Gravy: In medium saute pan, cook sausage until rendered and well browned. Remove and reserve. Add onions and cook for 5 minutes, or until translucent. Add butter until melted; then whisk in flour. Cook for 1 minute, stirring constantly. Add milk and chicken stock, whisking thoroughly. Add in reserved sausage. Cook over medium heat until thickened, about 5 minutes. Add more liquid if necessary to thin. Season to taste. Heat vegetable oil in an oven-safe skillet over high heat. Add smashed fingerling potatoes and cook until crispy and well browned, about 5 minutes per side. Top potatoes with sausage gravy and cheese curds. Bake until warmed through and cheese is melted, about 15 minutes. Garnish with chives and pickled peppers.